Established in 2011 as Thurne Hydrographic Ltd., the THURN Group has worked with many clients including offshore operations companies, survey services providers, and survey equipment manufacturers. We are near Norwich, UK, and have wide-ranging market experience in the survey sonars and ancillary equipment in the ports, oil & gas and renewables sectors, worldwide. The founder and General Manager of the THURN Group is Dr. Thomas Hiller. Tom is a Chartered Engineer (Engineering Council registration #573437) and Chartered Physicist (IoP #62506). We asked Thurn to assist with testing a sub-bottom capability on the Gaiva AUV. The project really benefitted from Tom’s experience integrating sonar systems into Gavia modules and his in-depth general knowledge of sonar applications and industry practice. Arnar Steingrimsson, Global Head of Sales - AUVs, Teledyne Marine. We contracted Tom to work on several projects at GeoAcoustics. He provided valuable input on high-end sonar developments and also helped with regional marketing efforts. Tom helped with data processing for a southern North Sea decommissioning project. His deep knowledge of the sonar operation, processing software and sonar physics helped make this project an outstanding success. Bo Krogh of Bo Krogh ApS, Kongens Lyngby, Denmark. At the Hydrographic Department, Peel Ports Medway, we commissioned Thurn’s services to assist in setting up a new high resolution swath sonar capability. The hands-on training helped us to understand how this system was put together and to fine tune the GeoSwathPlus mobilisation method in order to ensure the best quality of the acquired bathymetric data. 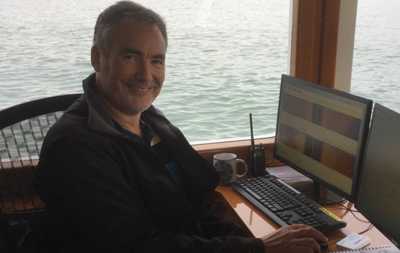 Tom's expertise and his great deal of experience in interferometric sonar technology proved vital in identifying and successfully tackling the electromagnetic noise sources within the Survey Vessel. His in-depth knowledge of the Geoswath Plus algorithms brought a lot of clarity and boosted efficiency in our post-processing. As a result - the whole new system could serve us at its full capacity very quickly.